Tom Finney turns 90 this week. A legend at Preston North End where he scored over 200 goals in 473 appearances he also won 76 England caps scoring 30 goals. The Second World War meant his Preston debut was delayed until 1946. 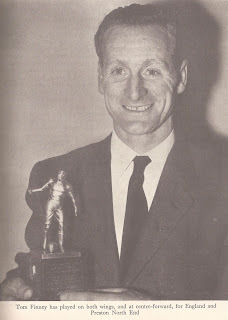 He went on to be voted England's player of the year in 1954 and again in 1957. "When I won again in 1957 I had moved to a centre-forward role at the age of 35. A bit late in the day for that maybe, but I scored 28 of our 80 goals and felt the second award was perhaps harder earned." "Pele was a great player. He must rank one of the best of all time. I've said that Tommy Finney was the best I've seen and I'd bracket Pele, Eusebio, Cruyff, Di Stefano and Puskas up there with him." 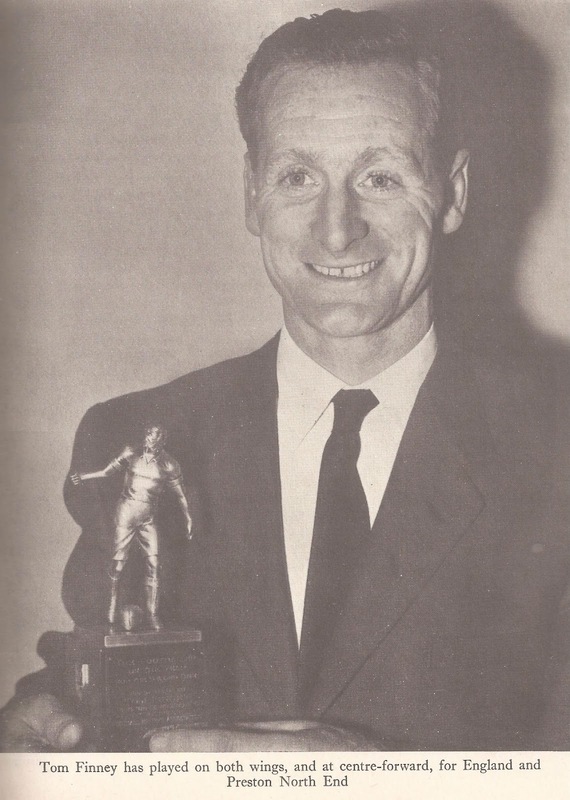 "Tom Finney was so good he could have gone through any defence while wearing a heavy overcoat. There have been few better players in history." Here, you feel, was a player who inspired his colleagues as much as he inspired supporters. The Preston plumber who became a gentleman great of the game. What could we learn from him? What is the greatest essential for success in football? This is one of a series of questions I am frequently asked concerning what is necessary not just to take a player to the top of the ladder, but also to make a really good footballer out of a promising one. Let's face it, there cannot be any ONE essential although love of the game, and a desire to play if for enjoyment is paramount. Skill and judgement in execution come next, then confidence in one's ability. Linked with all three is technical knowledge, such as knowing when and where to part with the ball. That is what we mean by the expression "a football brain." Last, but by no means least, comes physical fitness. Now do not get me wrong, or imagine that I am spoil-sport, when I say that so far as fitness is concerned I think alcohol and tobacco should be taboo. Frankly, I'd cut out both drinking and smoking, for if a young fellow aims to have a long career in the game he must be prepared to make sacrifices. Both Stanley Matthews and Billy Wright are non-smokers and non-drinkers, and think how long they have been turning in wonderful performances. To my mind they are the perfect examples of physical fitness, and, as I remarked earlier, to retain their skill and fitness have been prepared to make sacrifices. In the case of youngsters that goes for social pleasures as well. Dancing - although frowned upon after Wednesday by many clubs - is all right within its limit because of the exercise value - but too much of it is not, especially if it means keeping a young fellow up late. Never forget an athlete, no matter how tough he may consider himself to be, needs plenty of rest and he will just not get it if he is robbed of sleep by a succession of late nights. One of the biggest questions asked today, especially since the rise to prominence of European and South American soccermen, is: "What should a young footballer develop first of all? Is it physical fitness or ball control?" What I always stress, before giving an answer to this query, is that you cannot succeed without either. In the case of a youngster I would suggest that first of all he learn how to master the ball to the utmost of his capacity. After all, an active lad of sixteen, in reasonably good health, ought not to require much in the way of P.T. and other strenuous road work to put him into shape for a game of football. He ought to be at his peak - or very near it - and thus need only some sprinting exercises each day plus a moderate amount of gym work. In football, as in other sports, too many young fellows have attempted to crowd all their practice into a short time and failed. To become an expert - or even proficient - at anything demands patience. That is why I say ball control should be practised by degrees - one thing at a time - unless it comes naturally. I have always said, too, that it can be acquired to only a certain extent. Some are born with it. Alex James and Stanley Matthews, two of the most wonderfully gifted footballers in the history of the game, are perfect examples. Others have the idea, or the knack, which can be developed. Some, however, try as they will, make little or not progress because they do not possess the faculty. If you haven't got it you just cannot put it there! The proof of this is that some lads try, try, and try again, and are bitterly disappointed because they still lack the touch whereas others have a natural flair for the game like Bryan Douglas (Blackburn Rovers), Jimmy Greaves (Chelsea), and the late Duncan Edwards (Manchester United, and soon they are adding to the talents they already possess. Much the same applies when it comes to teaching the others. Alex James, it is generally accepted, was a magnificent football. He knew every trick in the book, as well as many of his own invention which others have since tried to copy without success, such as what was called his "double shuffle." Yet he could never impart his skill to those he tried to coach. The fact is that Alex James just did not know how he did it. It just happened. Alex did not sit down with pencil and paper and work out his movements. Neither did he travel miles to watch other stars perform. He was a natural footballer who performed his wonderful deeds instinctively and smoothly. The same thing can be said of Stanley Matthews - a player I admire so much as a footballer and as a gentleman. Stanley cannot demonstrate his baffling swerve to order. He cannot tell you what he does or how he goes about it. Apart from this it is very difficult to demonstrate unless one is gifted in this direction, too, for the "atmosphere" is missing. The tenseness of the crowd and the challenge of an opponent. Ought a youngster to practise heading at an early stage in the game? That's an old question, with many folk expecting one to warn against it for fear of a lad hurting his "napper," and I'm afraid I've surprised many by stressing the sooner a youngster learns to head a ball correctly the better it will be for him. Mind you, he needs to be careful about the way he approaches the matter or he might do himself some harm. I always stress to youngsters that they must avoid striking the ball with the top the head. "Always make sure you can see the ball when trying to head it," is my tip. Then, and only then, will you strike the ball with forehead which, after all, is the right and proper place. It has only been of recent years that young players seem to appreciate that heading is one of the basic skills. I remember, when touring with the England team in South America in the spring of 1953 that the Latins were most impressed with our headwork. Apparently they'd seen noting to equal it from any other visiting teams. And after we had left for home many club coaches gave instructions that heading was to be taken much more seriously. Personally I was surprised to that the Latin Americans, so thorough in all their other preparations, had neglected this important side of the game. After all, the more skilful you are in directing the ball in this manner, whether to get out of trouble as a defender, or to start a valuable attack as a half-back or forward, the more valuable will you be to your side. It cannot be stressed too often, by the way, that you do not need to be a big fellow to be a good header, as Billy Wright has so often demonstrated. The two secrets of success are timing and contact. Learn how to rise to the ball. The more spring you have the better, and, again let me point out, this is one thing that can be acquired. So far as the heading technique is concerned there are many ways of practising the art, either singly or in pairs, but gaining complete control is the most important aspect of all. Some of the Continental and South American stars are as good as top-of-the-bill jugglers and have acquired the skill only after long hours of practice. Notice how the word "practice" keeps appearing? After all, we agree there is no short cut to soccer success and if one is to learn how to take the swinging ball and then later develop the headed pass, one has to work at it. I've known Jackie Milburn - who never claimed to be a great header of the ball when moved from the wing to take over the centre forward position - have colleagues pump over centres at all heights and speeds for hours on end so that he could run on and ram it goalwards. Milburn worked hard at this work - and he succeeded in becoming a very useful header of a ball. As a student of football - as are most young fellows who now come into the game - I'm always intrigued when watching the great stars of world football perform in a big match. It really is interesting to notice how they have mastered the various skills, and if I'm asked to name the most complete footballer I've ever seen Johnny Carey (Manchester United and Eire), now successfully managing Blackburn Rovers, is the man who gets my vote. "Gentlemen Jim," as he was known, filled every position except goal for Manchester United. Be it full-back, half-back, or forward, Johnny could be relied upon to turn in a first-rate show. His all-round knowledge stood him in good stead. And all the time, as he so often told youngsters, he was learning something new about the game. Alf Ramsey (Spurs and England), now manager of Ipswich Town, was another gifted all-rounder. He played at inside and centre-forward and centre-half before settling down into become the most-capped of modern full-backs. A fine player who possessed the ability to make other fellows give of their best. If I were given the task of developing a promising youngster into an all-round footballer I would start by building on the essentials he would be expected to possess, such as natural ability and a love of the game, a willingness to strive. I would also see that his temperament was properly schooled, and then proceed to advance his knowledge of the basic arts and improve his execution of them. The wisest youngster is the one who will listen attentively to the old head who had been through the mill. I personally would not waste much time on a lad if it soon became clear that he was not prepared to listen to advice from someone who has been in the game a long time. I have always found that professional players are willing - anxious in fact - to help youngsters if they are prepared to help themselves, but they will not be bothered to pass on their valuable tips to those who "know it all," or, perhaps, think they do. For any youngster who wishes to make headway in the game there is no better training for him to go along and study at first hand the men who are outstanding in the various aspects of soccer. For ball control Stanley Matthews is of course out on his own. He possesses uncanny ability but, as I know through training with him, he is always hard at practice. Never does Stanley let up. Always is he out to improve himself - it that is possible. For any young man who wants to watch an artist in the art of ball control Stanley Matthews is the man for him to go along and study. Peter Doherty, Wilf Mannion, and Jimmy Logie, were others who became masters in this art, and when it comes to using the long ball accurately, the two men in present-day football I'd advise any would-be star to study are Ronnie Allen of West Bromwich Albion and Fulham's Johnny Haynes. They are a joy to watch with their precision passing. To play alongside them can be a dream for their colleagues. Smith, a product of the Chelsea Youth Scheme, was a promising player at Stamford Bridge before he joined the Spurs really to win fame, but I think a good deal of his success can be traced back to the work he put in after doing his chores as a ground-boy. It was not an uncommon thing for Bobby to spend hours by himself surrounded by a dozen or so footballs. From all angles, and various distances, he used to fire in shots at goal. At first he concentrated upon the "placing" of his shots. As Bobby developed accuracy so did he develop power. That is why today he must surely rank among the most accurate of current sharpshooters possessing a pile-driver of a shot. What of headwork? Again I do not think any young chap could do better than go along to watch either Billy Wright or Nat Lofthouse perform. In one instance - Billy Wright - you have the defender using his head well. In Nat's case he uses his "napper" all the time as a means of either scoring or "making" goals for his colleagues. Watch, by the way, how both these great headers of a ball time their leap into the air. It seems they rise just a fraction after their opponents - and the outcome is that they are still rising when their opponents are returning to ground. Experts who have studied Billy and Nat as ace headers of a ball swear this timing is one of the secrets of their success. 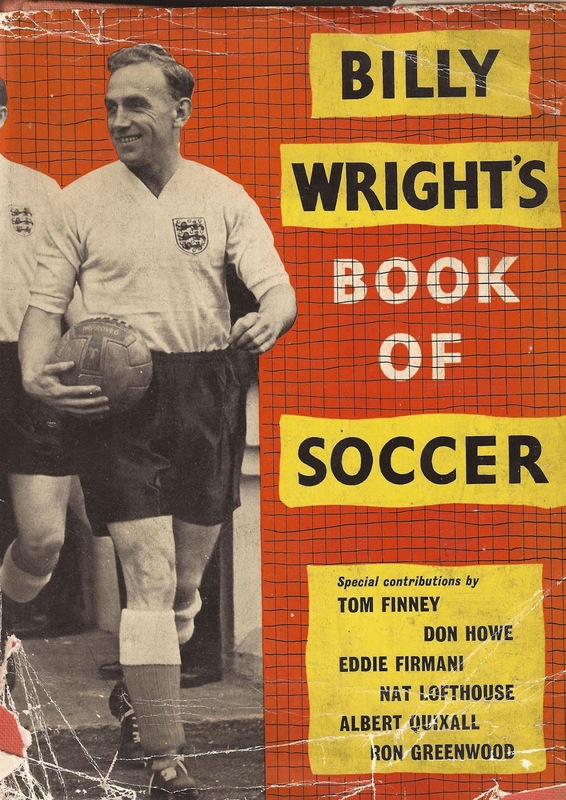 In tackling Billy Wright is again outstanding. Like Harry Johnston, who filled the England centre-half position before him, Billy is very powerful in the tackle and possesses the ability to come away with the ball and use it quickly and accurately. Once has gained possession Billy doesn't look up and admire his handiwork. He gets on with the game and uses the ball when time is still on his side. When you come to discussing speed off the mark Stanley Matthews is still in a class by himself for a short burst. His acceleration from a standing start is little short of marvellous, especially when one realises he is forty-three years YOUNG. His tremendous acceleration makes all the difference between getting the ball and gaining a start on the opposing full-back. Once more I must point out that consistent practice is one of the reasons for Stanley Matthews' acceleration. Not for Stanley the glory of sitting back and enjoying his success. I've watched him, all by himself, put everything he possesses into this section of training. He still has the zest of a schoolboy. Maybe that's why he remains fitter than a large percentage of men who are twenty years younger. In every way is he an object lesson for the lad who wants to get a close-up of the master of soccer acceleration. In the past there used to be mixed views about young players moving about the field, trying one position after another until they found the one they enjoyed filling most of all, but I think it an excellent idea. The more experience a youngster can gain the better in the long run it will be for his game. Can a youngster learn much though watching the star footballers when they take part in a match. I believe young footballers can benefit a good deal, especially if they have a receptive mind and do not quickly forget what they seem for I know there are dozens of hints to be gained through watching the play of the masters, but the "big-head" will either be finding fault or to blasé to think he has anything to learn. Last, but by no means least, what would I advise about the very important thing, keeping one's temper? I can reiterate the old proverb: "Keep your temper which nobody else wants." Learn to be a good loser. Be prepared to lose with a smile. It's never a disgrace to be beaten by another man on the day's play, and nothing is ever gained by resorting to shady tactics to save your own face. YOUR BEHAVIOUR IS A GUIDE TO YOUR TEMPERAMENT, AND ONLY YOU CAN CONTROL THAT! Never forget, either, the complete footballer is the one who never forgets that soccer is a GAME. The Digital Board is a brand professional SEO company that has been giving its services from many years. There are millions websites flourishing on the top- 10 ranking with a massive traffic.